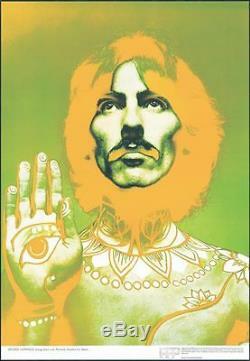 GEORGE HARRISON BY RICHARD AVEDON. The Beatles - GEORGE HARRISON. 19 x 27 inches - poster 50cm x 70cm each. Iconic pop art images created by Richard Avedon and distributed by Stern in Europe. THE poster is mounted on linen by a museum quality artisan so that the poster is protected from yellowing (ph+) and anti fungus so that it will not deteriorate in the coming years. Original Vintage Posters from Franc e. We accept most major credit cards. All posters are described accordingly along. Posters offered for sale are guaranteed to be authentic. We offer expert advice on Antique advertising Posters. We are located in Saint Jorioz, France, we sell both wholesale and retail. Saint Jorioz is about an hour from the Italian border and 45 minutes from the Swiss border. We travel in all three countries searching for Vintage French Posters and Vintage Italian Posters. Each poster we sell is guaranteed to be an original and authentic or we clearly state when it is a late printing. We speak English, Italian and French. We welcome inquiries from collectors who would like to sell posters as well. We are happy to offer advice and have collectors come back time and again. We hope you enjoy your visit. The item "ORIGINAL POSTER OF GEORGE HARRISON BY RICHARD AVEDON FOR STERN 1968 BEATLES" is in sale since Sunday, December 04, 2016. This item is in the category "Art\Art Posters". The seller is "posterclassicsfrance" and is located in Duingt. This item can be shipped worldwide.